I always have an eye out for an easy and fun activity for the kiddos. And the internet is chocked full of them. So much so in fact, that any mother’s head could spin! So where do you even start? While I find Pinterest an incredible tool, linking you quickly to some amazing bloggers with endless creative and thoughtful ideas, most of the time its all just too overwhelming! We have enough going on in our lives! Which brings me to my post. Since I like finding a new activity, every once in a blue moon, for the girls. When I find a good one (like this one! ), I will document what we do, share it with you. Give you all the info so you can easily do it yourself. Of course after I blunder a bit with it first, but that is what give you TIPS on how to do it better! Today’s kids activity comes from a company called ALEX Toys. I tend to follow a lot of random companies that I stumble across via Facebook and this is one of the best ones. 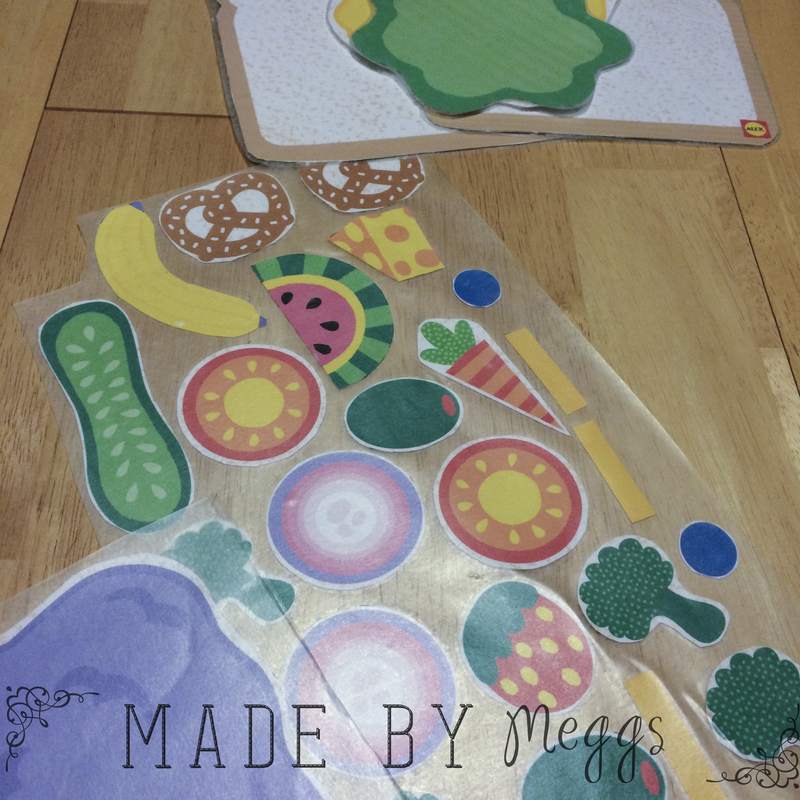 ALEX Toys blog frequently posts really nice and FREE printables for kids. And they seem to appeal to a decent age range. I’d say most kids 1-5 would enjoy the variety of printables they have to offer. You can print how ever many of each page of the activity. 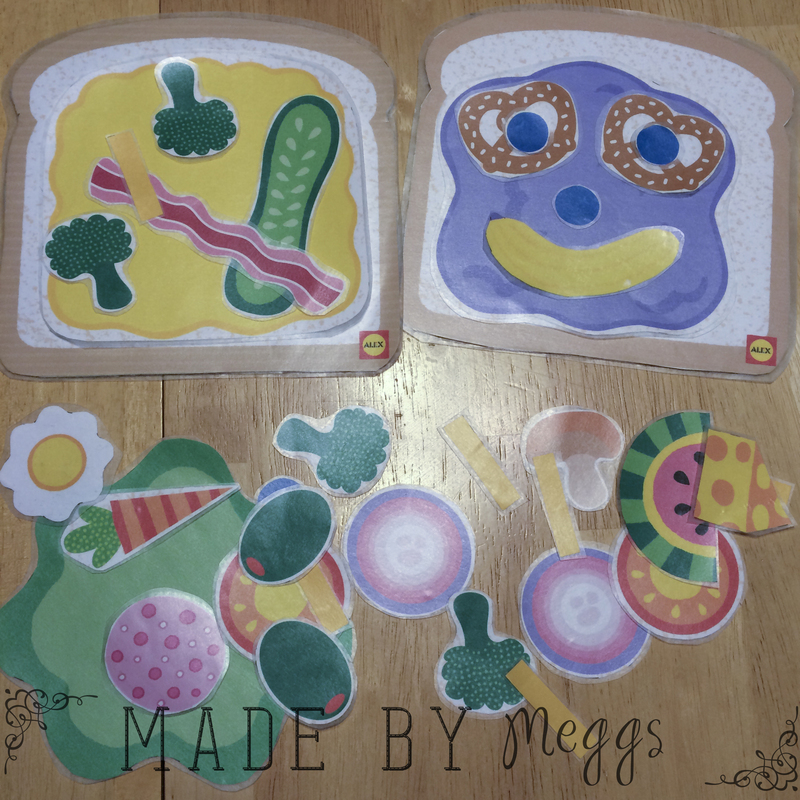 I chose to print two slices of bread, one for each of my girls, and one set of the toppings (sharing works well with two children and one set). The roll of contact paper can be purchased at the dollar store. (18 in x 1.5 yd). Look for it in the kitchen area, it sold as a “shelf liner.” I had a decent amount left over, so even if you print more pages you should have plenty with one roll. For thin cardboard, think old cereal box, or tag board. I added this as a backing to the bread pieces just to make them a bit more sturdy. You could add it to all, some, or none of the pieces – this is entirely optional. Glue any pieces you want to the cardboard, this step is optional. Clear and clean your work space! The contact paper has a bit of static to it which will attract scrap paper and dog hair (learned this the hard way!). Unroll the contact paper, use items to weigh edges down as you work. This likes to roll back up on itself. Cut a section about as wide as a piece of paper (this does not need to be percise) and the entire width of the roll. Fold your section in half. To create a crease line at the half way mark. Carefully and slowly peel the backing off of HALF of the strip. Fold the backing over, or tearing it off. Place pieces (face up or face down it doesn’t matter) all over the sticky side. IMPORTANT! Leave about a 1/2 inch gap between each item to give them a “border” you can cut around. Did you use cardboard? Make the border an entire inch. Un-peel the rest of the contact paper and carefully fold it over your sandwich pieces. This creates the backing. And seals in your activity pieces. Contact paper MUST touch itself to make this work best. Make sure that you press it all entirely flat, remove any bubbles. Repeat steps 4-9 until all pieces are done. Then cut them all out and store in a gallon Ziploc bag. I know to some of you this whole process may sound ridiculous! But as a teacher (at heart) and self proclaimed froogle lady… Anything that can entertain my kids like this and is pretty much free, is completely worth the time I put in. Plus I did all this while watching Scandal & drinking wine, so win-win if you ask me! Now I have the start to my Busy Bag collection. And the girls love to play this at the table while I prep a meal. The preparation while “watching Scandal” reminded me of all the planning I would do at home and you were always happy to help me cut out all the little ‘build a taco’ or ‘name that shape’ pieces (or whatever else I needed at the time) while watching TV. We would have itty bitty construction pieces all over the place and then corral them into sandwich baggies for my classes the next day. Thank you for all your help over the years and the memories now.